Quantum computing is powerful because unitary operators describing the time-evolution of a quantum system have exponential size in terms of the number of qubits present in the system. We develop a new "Singular value transformation" algorithm capable of harnessing this exponential advantage, that can apply polynomial transformations to the singular values of a block of a unitary, generalizing the optimal Hamiltonian simulation results of Low and Chuang. The proposed quantum circuits have a very simple structure, often give rise to optimal algorithms and have appealing constant factors, while usually only use a constant number of ancilla qubits. We show that singular value transformation leads to novel algorithms. We give an efficient solution to a certain "non-commutative" measurement problem and propose a new method for singular value estimation. We also show how to exponentially improve the complexity of implementing fractional queries to unitaries with a gapped spectrum. Finally, as a quantum machine learning application we show how to efficiently implement principal component regression. "Singular value transformation" is conceptually simple and efficient, and leads to a unified framework of quantum algorithms incorporating a variety of quantum speed-ups. We illustrate this by showing how it generalizes a number of prominent quantum algorithms, including: optimal Hamiltonian simulation, implementing the Moore-Penrose pseudoinverse with exponential precision, fixed-point amplitude amplification, robust oblivious amplitude amplification, fast QMA amplification, fast quantum OR lemma, certain quantum walk results and several quantum machine learning algorithms. In order to exploit the strengths of the presented method it is useful to know its limitations too, therefore we also prove a lower bound on the efficiency of singular value transformation, which often gives optimal bounds. Gilyén, A.P, Su, Y. (Yuan), Low, G.H. (Guang Hao), & Wiebe, N. (Nathan). (2018). 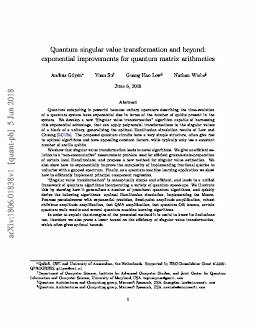 Quantum singular value transformation and beyond: exponential improvements for quantum matrix arithmetics.